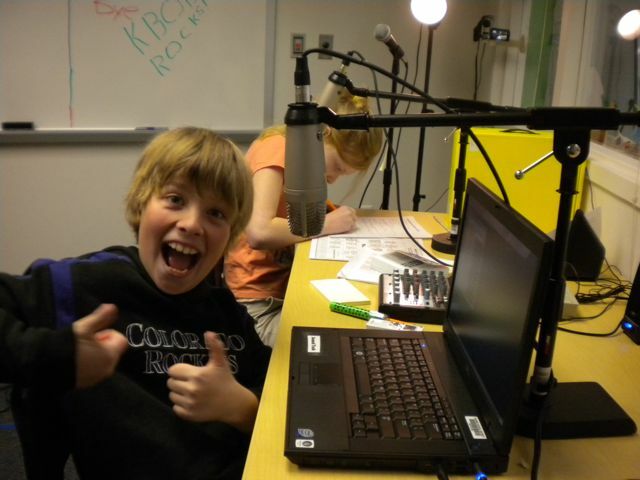 Today I had the chance to show off my podcasting 10-year-olds. It was part of a demonstration I was giving on what 4th grade students are capable of doing with current school technology. So in front of 450 local business leaders my two little podcasters did it. I am telling you, I have never been so proud. They were fearless. I have been podcasting with my students for the past year. Every day they do a podcast of the school announcements each with a little personal twist of their own style. At first it was difficult to get it all together but then we started to work out the bugs and now the students run the whole show. They have over 1700 subscribers on iTunes -- students from all over the world. The digital natives of today are so used to seeing the world as a potential audience. You just wait, it won't be long before they are wanting their own dressing rooms with a star on the door. If you would like to hear our podcasters, go to iTunes and search for KBOB.